On September 17, 2001 Ty announced his newest Product line Jingle Beanies. Miniature Beanies meant to be Christmas Tree Ornaments! They could also be used for a wide variety of other things, including rearview mirror decorations, or to just hang in places around the house! Each Jingle Beanie (The first set of Jingle Beanies did not actually jingle, though later releases do!) has a piece of ribbon sewn to the top of their heads or body so they can hang on anything! There were nine Jingle Beanies announced at first, they are Rover, Quackers, Peace, Twigs, Halo, Loosy, and the 1997 & 1998 & 1999 Holiday Teddies. These little guys are made with the same high quality production we are accustomed to seeing in Beanie Babies. They also have Hang tags and Tush tags just like their larger counterparts. In fact the tags are the same size! This first generation of Jingle Beanies have a holiday designed hang tag, the words Jingle Beanies is written with candy cane looking letters. Inside of their hang tags there are two lines, one for who the Jingle Beanie is to and one for who the Jingle Beanie is from! You can read the original aboutBeanies news article announcing these new guys here! On September 24, 2001 the new BBOC (Beanie Babies Official Club) opened and with it came several new products BBOC members could order including 4 new Jingle Beanies! Each new Jingle Beanie is one of the Club Bears, Clubby I - IV! For pictures and more information about the opening on the BBOC click here! 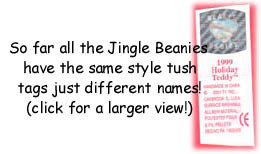 Click here for a checklist of all Jingle Beanies! All of the original 9 Jingle Beanies were retired on Jan. 01, 2002! All of the BBOC Jingle Beanies were retired on Jan. 23, 2002! The Clubby Jingle Beanies were only available on the Ty.com BBOC website, for more information about this click here! All of the Clubby jingles came packaged together in a special box!